Alison Roman has amassed serious social media stardom because her recipes have three enviable traits: fun, simplicity and deliciousness. This collection of 125 ‘why didn’t I think of that’ recipes, including treats like roast chicken smeared with anchovy butter or crispy baked potatoes, are absolutely obtainable by even the most amateur of home cooks. This cookbook is perfect for anyone living life at a hectic pace but still wanting to ensure a home cooked meal with a fancy touch is within reach at any given moment. This is not a book for the faint-hearted home chef, but it is a perfect resource for those who want to know exactly how to cook our fine feathered friends. Using brilliant photography, Booth takes you through a detailed guide to cooking both common and unusual species of bird, preparing eggs, small goods, sauces and accompanying dishes. Think of it as the _Silver Spoon _of fowl, and all from a Melbourne home cook. Scheltus has made coffee his life’s work. He is the director and co-founder of Market Lane Coffee, one of the most respected specialty coffee companies in Australia (and where I get my coffee every morning). This book could save me money, because under his guidance I should be able to create impeccable home espresso. Each step of the process is detailed here: grinding, tamping, extraction, and manual brewing methods. This book is ideal for anyone in search of the perfect coffee. In Salt & Time (available 12 March), chef Alissa Timoshkina has used her talent to create a collection of delicious modern recipes from Siberia and beyond that will transform perceptions of the food of the former Soviet Union. The 100 recipes range from hearty chicken soup to delicate cakes. Each is adapted for modern tastes and is presented with evocative storytelling that both explains and entices. This cookbook is a delicious bridge from one culture to another. If we are all one-eyed devotees of Ottolenghi, it’s because we haven’t yet discovered the delicious food of Haya Molcho. This wonderful cookbook highlights why Molcho will be our next foodie crush. In this book, she takes us on a journey to meet Tel Aviv’s chefs, capturing the distinctive spirit of the city’s many cuisines. There are recipes for one plate meals, shared feasts and, of course, a recipe for hummus. Let the hummus rivalry begin, I say! This very cute cookbook is designed to take you on a road trip of Tokyo and its food. There are recipes for ramen, sushi, barbeque and more. It’s a smorgasbord of wondrous sights, tastes and desserts. This book makes cooking Japanese easier by showing you tricks of the trade, and is the ideal gift for anyone who dreams of visiting Japan or indeed has returned and wants to set up their very own ramen bar almost straight away. 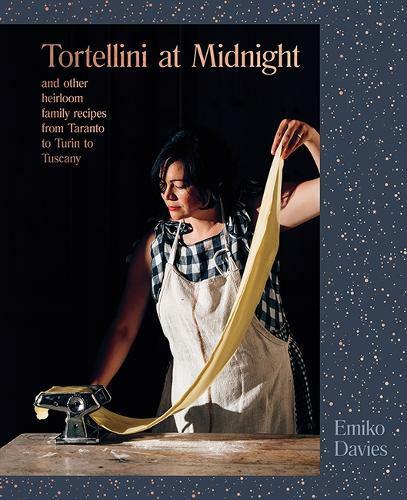 The recipes in this pretty book take us from the beginnings of a traditional Italian meal to the very end, with significant emphasis on fresh filled pasta. The recipes come from four generations across Italy, and so it is the perfect book for those who dream of travel, or who want their kitchen to be filled with bubbling pots of passata, jugs of basil, and chopping boards scattered with cheese and biscotti. This is my type of book, the type that is good for the soul. Blogger and author Cheng wants to show you how easy it is to fill your home with plants. The New Plant Parent (available 19 March) is filled with practical and pragmatic advice on how to ensure your plants thrive. After reading Cheng, the indoor gardener (you!) will be a more confident and active grower, able to rely on new skills of observation and insight. I promise, this book will give anyone a fighting chance of creating their very own home jungle. Chris Gordon is the events and programming manager for Readings.